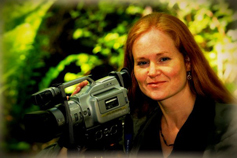 Executive Producer Jennifer Pickford is an award-winning filmmaker who has worked in a producer's role on numerous documentaries for broadcast, and corporate and promotional videos. Jennifer produced and directed the critically acclaimed broadcast hour documentary Crimes of Compassion for Global Television. She has also produced programming for CTV, CBC, Rogers, Prime, Knowledge, W, Corus Entertainment and Noga Communications in Israel. Her films have been screened at numerous festivals and exhibitions around the world. Jennifer's vision as a director is to produce socially relevant films with the intention of stimulating positive change. Some of the themes she has explored in her films include environmental and Aboriginal issues, women's rights and alternative health. Jennifer was recently awarded the Times Colonist award as one of Vancouver Island's 2006 "Top 40 Under 40" for her achievement in the field of Entertainment. All contents © 2012 Pickford Productions. All rights reserved.